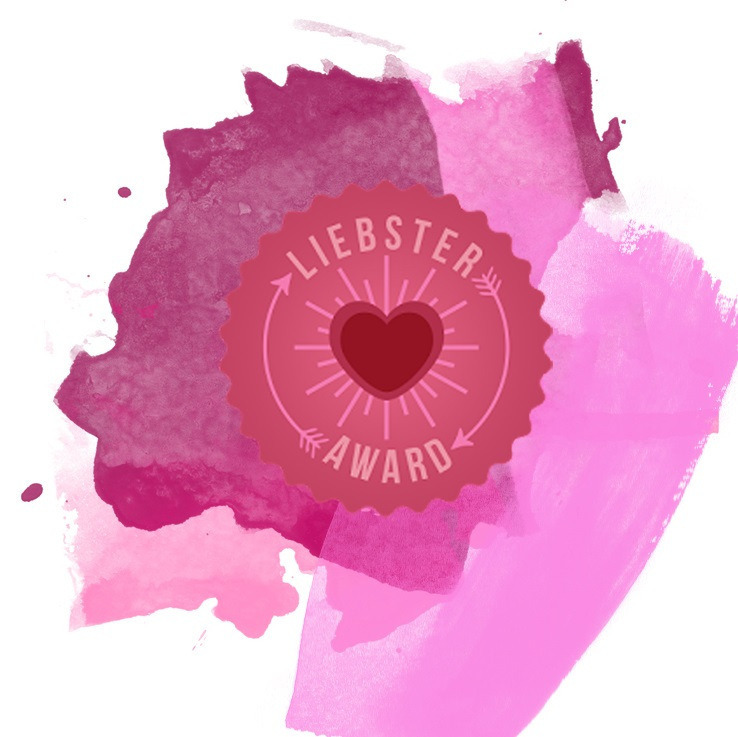 Nominate up to 11 other bloggers. Notify all nominees via social media and/or their blogs. Writers rejoice when their publishing dreams come true, but it’s equally thrilling when the same happens for a writing pal. I met Alyssa Palombo back in 2004, on an official messageboard for the symphonic rock band Evanescence. That’s where we bonded over music, the Boston Red Sox, and writing. We fell out of touch after a while, but I always remembered how helpful Alyssa’s feedback had been and wondered if she was still writing. The answer came in 2014, when I stumbled across Alyssa’s book deal announcement for her first two books. No lie – I was so happy for her, I freaked out! Today, I have the immense pleasure of having Alyssa Palombo here on the blog. We talked about her historical fiction debut The Violinist of Venice, which comes out next Tuesday, December 15th. (Click here to read my review.) You’ll also learn how her music background helped with writing the book, and why she recommends reading outside your preferred literary genre now and then. And, um, there might be lots of some fangirling (on both her part and mine) about metal music and tea. 😉 Let’s begin, shall we? “Chronicling The Craft” is an article series where I share my experience with writing my current work-in-progress (WIP), which is a fantasy novel. Every 5,000 words, I let readers know what I’ve accomplished since the previous article and share advice, discoveries, techniques, etc. Besides the word count in each article title, a “chapter ticker” at the top also tracks my progress as I use the skip-around / “writercopter” method to write the novel. Today’s installment celebrates the book reaching 90,000 words in length. If you’ve followed my music tastes over the past couple years, The Mariana Hollow may already be a familiar name to you. This alternative metal quintet from London, United Kingdom was hands down my favorite discovery during my tenure at Sonic Cathedral. Muscular rhythms, oceanic guitarscapes, evocative lyrics, and a gritty yet impassioned female voice – this unique amalgam has always made TMH a stand-out act. Recently the band released two videos for “The Unburned”: one featuring the band, and the lyric video highlighted below. Maybe I’m biased, but how cool is the lyric video?! The archaic animations look like they came straight out of the medieval / Westeros era and make countless references to George R.R. Martin’s A Song Of Fire And Ice saga. “The Unburned” itself was inspired by the character Danaerys Targaryen. Musically, this song is like one of Dany’s dragons prowling the desert before taking flight. It builds slowly, shouldering the gravity of its riffs and a thick sultriness, as Rebecca Spinks sings with a storyteller’s passion. It’s a truly unique song from TMH’s repertoire – and if you like this track, I highly recommend you check out other songs by this band! “The Unburned” is taken from The Mariana Hollow’s 2013 EP Scars, Not Wounds. You can read my review of the EP at Sonic Cathedral here. Throngs of new female-fronted rock and metal bands put out albums each year. Divided We Fall is one of those many newcomers for 2014. Apparently the symphonic metal band was a surprise hit at this year’s Dames Of Darkness Festival in their native United Kingdom. 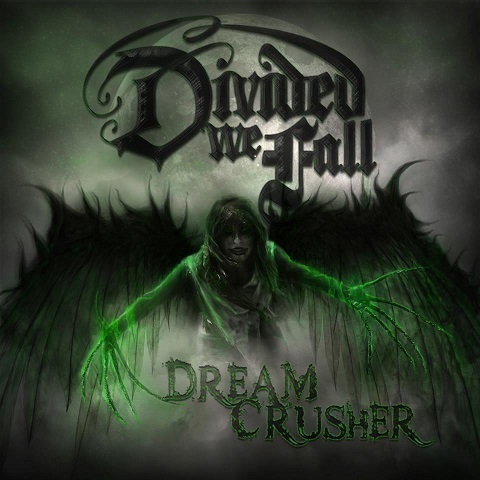 So, when a friend who attended the show recommended that I check out Divided We Fall’s full-length debut album Dreamcrusher, I figured, “Why not?” Every band is worth a listen, regardless of your opinions afterwards. Dreamcrusher offers a hybrid of dark rock and jack-hammering metal, with lighter elements that steal the spotlight. Philippa Ricketts’s pleasant, cadent voice sashays between the riffs and keyboards, which range from Transylvanian organs to synth-strings to music-box-like notes. This emphasis on atmosphere and melody softens Divided We Fall’s sound to create an accessible rock / metal balance. This approach may explain why Divided We Fall reminds me of Armonight, an up-and-coming Italian band I covered for Sonic Cathedral a couple years ago. The only difference is that Divided We Fall leans on the heavier side in terms of guitarwork and moods. For the most part, Dreamcrusher is defined by its saturating atmospheres, Philippa’s vocals, and the brisk pace maintained from start to finish. The title track is a rousing introduction, with eddies of guitars and keys swirling at a fluid clip and Philippa giving her most affecting performance on the album. The rest of Dreamcrusher shows different angles of Divided We Fall’s sound: organ-tinged omens (“Revenge”), guitar-centric surrenders (“Fight For Love”) smooth uptempo ballads (“Dream My Life Away”), and semi-symphonic twists on fairy tales (“Escaping Wonderland”), to name a few. Closing instrumental “Departure” is the album’s only true ballad, alighting with lyrical keys before the other instruments slip in. I can understand how Divided We Fall’s music may appeal to fans of female-fronted rock and metal, but Dreamcrusher doesn’t do much to excite me. The songs are pleasing to the ear but not particularly catchy despite the band’s melodic nature. Some elements seemed out of place, too. (Why include operatic vocals on just one song out of ten?) And while I normally try to avoid commenting on mix quality when reviewing unsigned bands (most don’t have the finances or connections to get a first-rate sound mixer), Dreamcrusher could have benefitted from a generally better mix. The keys repeatedly wash out the guitars, while the fade-out endings are too abrupt and occur surprisingly often for a rock/metal band. All that said, imperfection should be expected on a band’s debut disc. And while Divided We Fall need to hone their songwriting and fine-tune their sound, they have succeeded in creating a distinct, energetic style. Listeners can detect influences from Evanescence, Delain, Within Temptation, and Kamelot if they concentrate hard enough. But calling Divided We Fall anyone’s copycat would be an insult to a vision that does show glimmers of promise. I wouldn’t recommend Dreamcrusher to those craving the cream of the “femme metal” crop. However, it makes a decent “gateway” album for metal newbies who might prefer something lighter and more melodic to start. Coming Soon: Two more Music Monday Reviews are in the pipeline, for Anathema’s Distant Satellites and Phillip Phillip’s Behind The Light. Let me be clear: I wasn’t expecting a repeat of the last album. With Dianne van Giersbergen replacing previous frontwoman Manuela Kraller last year, I knew Sacrificium would be different. And it is, with a slight power metal edge, a greater choir presence, and a more sophisticated air – almost like Epica without the male grunts. As for Dianne, fans who are familiar with her work with her other band Ex Libris already know she OWNS the mic. Her expressiveness and operatic gymnastics rival the likes of Floor Jansen and Tarja Turunen. Dianne shows shades of her vocal colors on Xandria’s new material, but she doesn’t paint with her entire palette. Instead, she takes a more conservative and reserved approach that pales in comparison to her Ex Libris recordings. Comparing the work of two different metal bands here may not be the fairest way to review. But with Ex Libris releasing a new album just a few months ago and Dianne’s outstanding performance there still fresh in my mind, it’s awfully hard not to. What disappoints me more about Sacrificium, though, is that none of the new songs stand out to me. They’re not terrible, but most of them sound… well, like filler. I remember very little about this album when I finish it, so I walk away unmoved each time. 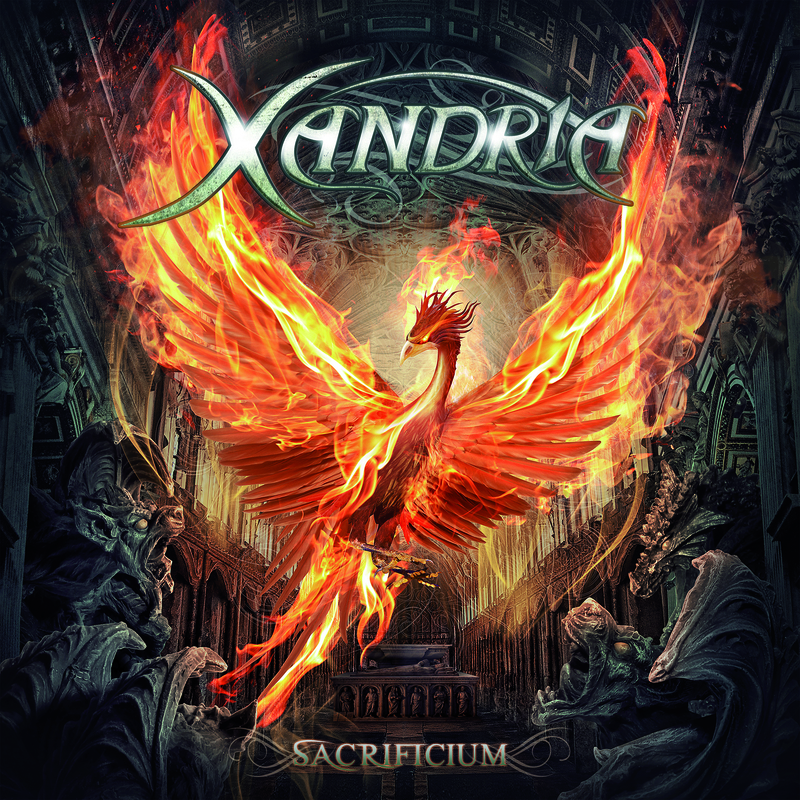 Also, my brain just can’t process Sacrificium as a Xandria album. It’s convinced that a completely different band is playing. Sure, this album’s equally as bombastic as Neverworld’s End, but the latter album retained the playfulness and sensuality we’d heard from Xandria on other older albums, going back as far as Ravenheart. I can’t detect those qualities anywhere on Sacrificium, and I miss them. Sacrificium does have its bright spots. “Stardust” funnels a flurry of guitars, choirs, and synth-strings through an exhilarating worm hole, complete with (what sounds like) a sci-fi lyrical slant that’s new for Xandria and works well. “Betrayer,” on the other hand, breathes down the listener’s neck with saturated, throttling guitars. No competition here for the title of this album’s “Soulcrusher.” (If you own Neverworld’s End, you know what I’m talking about.) “Temple of Hate,” the short yet pretty “Our Neverworld,” and the exquisite winter-tale “The Undiscovered Land” are also worth revisiting. I can’t say the same for the rest of Sacrificium, though. Even while listening to this CD to write this review, I’m fighting the urge to switch to other Xandria albums in my collection. Stylistically it may be a good example of symphonic metal’s grandiloquence. But as a listener, I want to be stirred or inspired – I want to feel something beautiful. Indifference with streaks of pleasure is how Sacrificium makes me feel, and that’s not what I’d call beautiful. I’ve been an Epica fan since 2006 and either liked or loved all of their albums, with Design Your Universe my all-time favorite of theirs. Then came Requiem For The Indifferent in 2012. No matter how many times I listened to it, I walked away bored by its musical wanderings and lack of inspiring melodies. 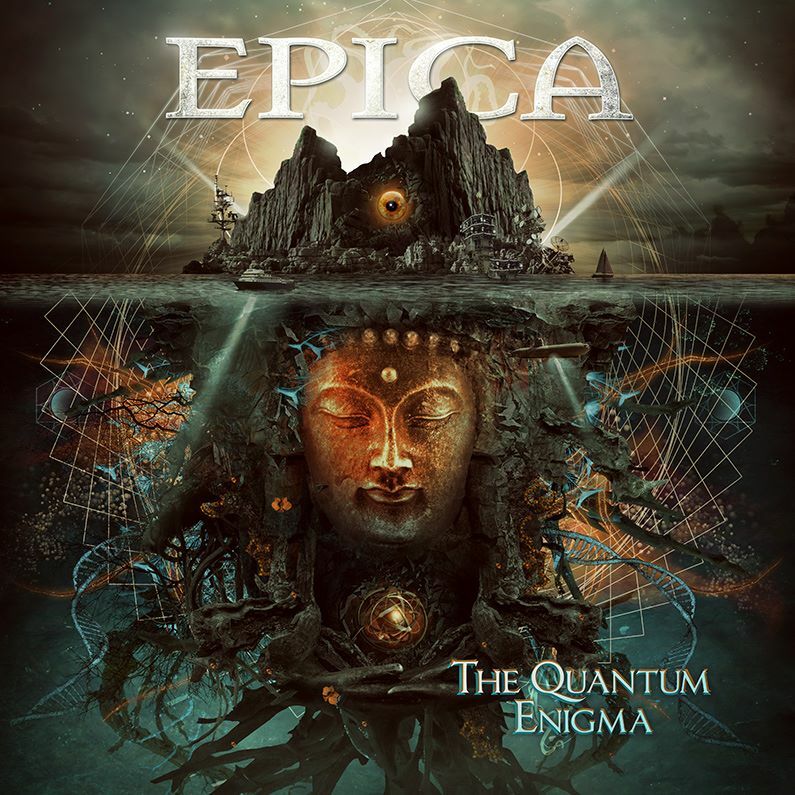 So, when Epica announced the release date for their sixth studio album The Quantum Enigma, I hoped like a maniac that the Dutch symphonic metallers wouldn’t disappoint me again. I wasn’t looking for another Design Your Universe, just an improvement over last time. Now I can breathe a sigh of relief – because The Quantum Enigma hasn’t let me down. In fact, I like it more with each spin. Change seems to be the overall theme on this album. Instead of continuing with long-time producer Sascha Paeth, Epica worked with Joost van der Brook, who’s produced albums for a slew of other female-fronted metal bands (Stream of Passion, Xandria, ReVamp). The Quantum Enigma also features live strings for the first time since 2005’s Consign To Oblivion, a massive professional choir instead of a “choir-like” group of session vocalists, and a more modern metal sound. Mark Jansen and Isaac Delahaye have really honed the guitar sound for the new material; it’s thick, complex, razor-sharp, and at times appealingly tangled and chaotic. This new edginess gives fresh perspective on some songs (“The Second Stone,” “The Essence of Silence,” “Chemical Insomnia”) while enhancing the band’s triumphant sound of old on others (the title track, “Sense Without Sanity,” “Unchain Utopia”). The Quantum Enigma’s brightest highlights show Epica’s ability to reveal subtleties in complex arrangements. The title track is a stunning example; it’s a 12-minute blossoming flower, unfolding in the same purposeful way as past climactic epics. And how about those memorable hooks and melodies? They were sorely missing from Requiem… and now make a welcome return. The strongest hooks transfer effortlessly from one instrument to another, from ascending keyboard / guitar lines on “Natural Corruption” to the graceful Oriental wind and acoustic notes on the gorgeous instrumental “The Fifth Guardian.” As for melodies, the title track’s call-for-action choral chants are bound to stir concert crowds to sing along, while bonus track “In All Conscience” boasts the band’s most majestic chorus ever. I have to admit, my initial impression of The Quantum Enigma was tainted by the first two tracks. The flurry of excessive high notes in “Originem” grates on my nerves, while “The Second Stone” starts off exhilarating but loses its energy come chorus-time. Together they soured my mood enough for the rest of the album on that first listen. Now I skip those two tracks and listen to the rest of the CD thinking, “Hey, this is better than I originally thought!” I say that now because The Quantum Enigma is a stronger, more memorable collection of songs than Requiem…. Some melodies and musical moments do fall flat or feel recycled, and sometimes I wish frontwoman Simone Simons would sing with more emotion like how she did on past albums. Overall, though, I enjoy this set almost as much as I enjoy Design Your Universe and 2007’s The Divine Conspiracy. I can’t say that every fan who was dissatisfied with Requiem will like this new albummore. But for me personally, The Quantum Enigma rights the ship that was tipping two years ago. The grittier direction, improved songwriting quality, and return of live strings all help to inject new life into the music. So, in short, this album has restored my faith in Epica. And in a year when other big names in the female-fronted metal realm haven’t satisfied me, The Quantum Enigma is an ultimately gratifying winner. Coming Soon: Stay tuned for Music Monday Reviews on Xandria’s Sacrificium and Divided We Fall’s Dreamcrusher in the coming weeks!